I mentioned last year that I loved the Quake pattern I have made. It inspired me to raid my pre-cut bundle bookshelf and cut up a bunch of rectangles to make quilts for gifts and charity. 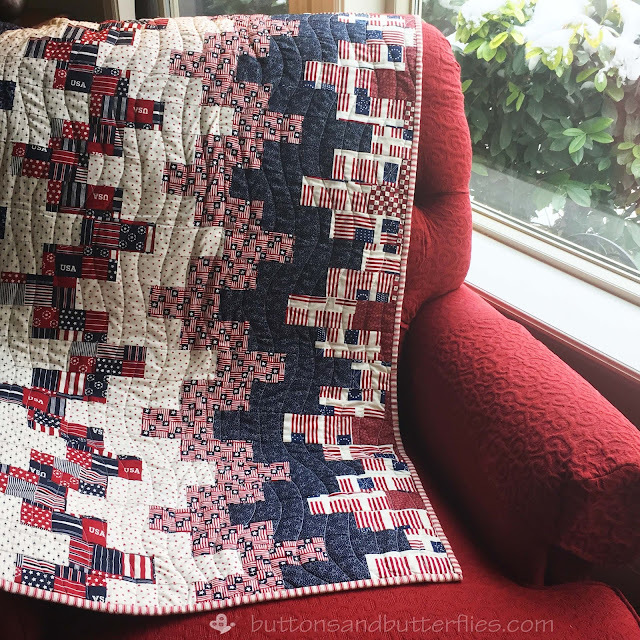 This quilt was a Red, White and Blue fat quarters with a few other random patriotic styled Fat Quarters from Joann Fabrics. The Quake pattern, once again, came together very quickly. 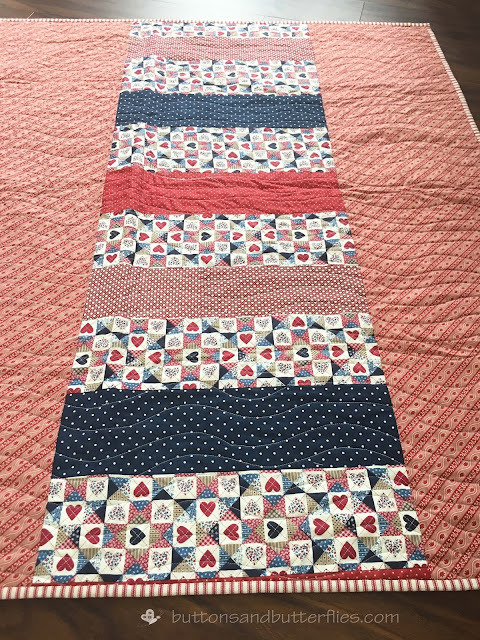 I will admit that I'm not sure what happened when I was piecing this one last summer, but the strips really started to get very curvy? I suspect it was an example of mindless piecing where I didn't make sure the weight of the strips were evenly going along my foot. OR I was just impatient, as usual, during the tube/cutting process that I didn't cut evenly. I did unpick and re-pieced the entire top with a bit more luck. 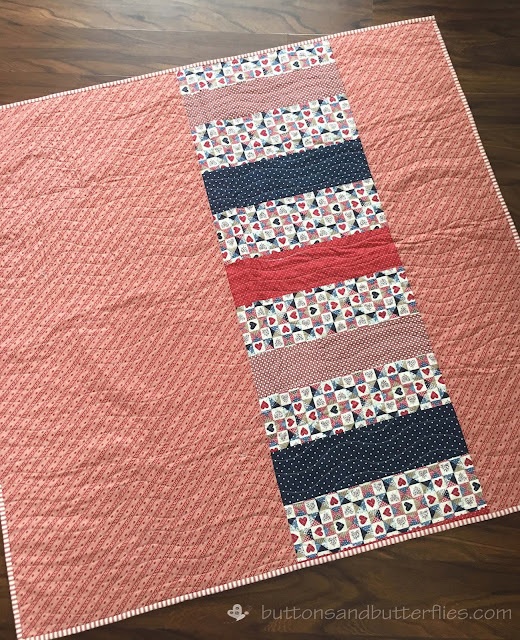 I decided on pieced backing with fabrics I had in my stash. and paired it with a Moda Three Sisters Diagonal Stripe. 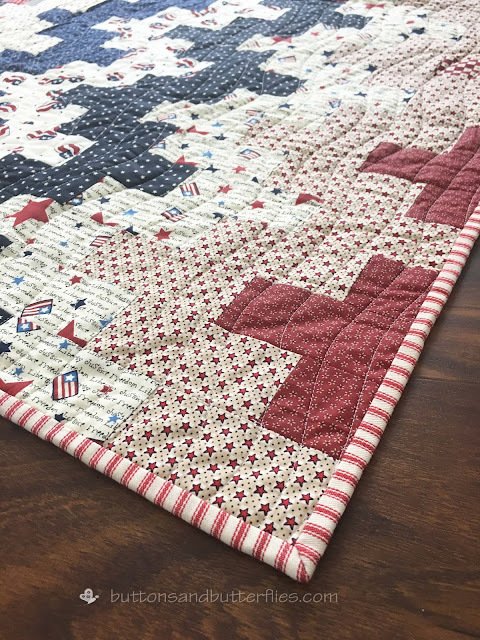 I found a fun quilting pattern that I've been seeing around the internet. After practicing and seeing the example I was shooting for, I realize now where I went wrong. But I really don't mind the results! Binding red and white ticking home decor fabric I have used a few times. I sometimes like using unexpected fabrics for my binding. 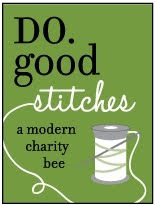 I've decided that I don't like the quality for a charity or a quilt gift. I don't have a quilt that I keep in the car for picnics or fireworks? I also noticed that it fit right into hubby's traditionally styled home office when I was trying to take photos, so I think it will work out for the more patriotic holidays! It's really pretty! 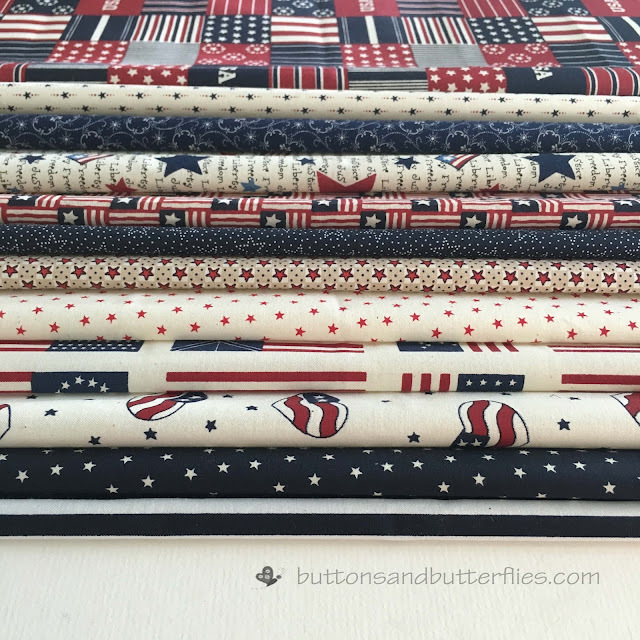 I like how it's patriotic but still an unusual pattern. That ticking binding is a stroke of genius. It works so well with the red, white and blue that has a modern vibe because of the pattern, but it adds a touch of vintage, also. 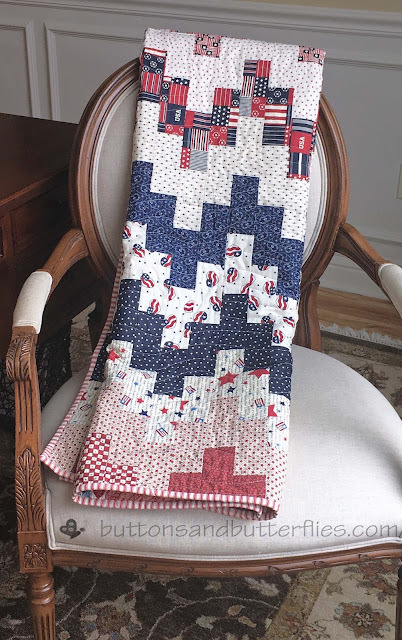 Your quilt is one of my favorites from today's blog hopping session. 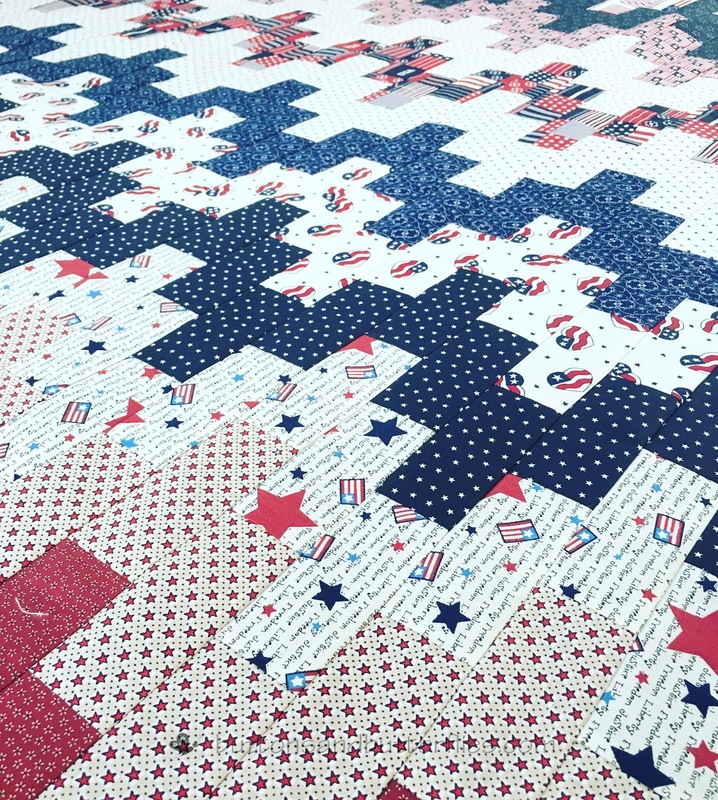 I really like your patriotic quilt. 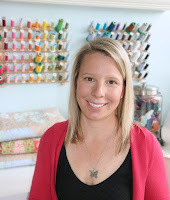 Great use of those fabrics.